Are you suffering from a tooth that’s pained or incredibly sensitive? 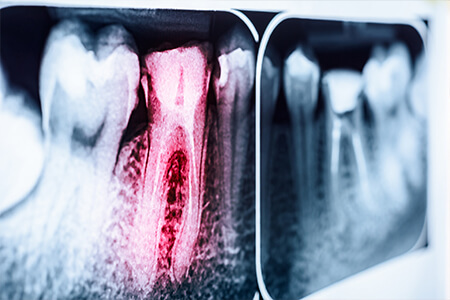 These are likely signs that a bacterial infection has penetrated the outer layers and reached the vulnerable pulp and root canals within, leading to the threat of extraction. Thankfully, root canal therapy may be able to treat the infection while allowing you to maintain your natural tooth here at Pasadena Family Dentistry. Dr. Holmes, Dr. Revel, and Dr. Lowry take pride in being able successfully treat oral discomfort and help patients smile confidently once more! If you’re ready for an appointment here in Pasadena, TX, please give our office a call today. During this in-depth procedure, one of our doctors will carefully access the inner chamber of your teeth so that the canals can be thoroughly cleaned. After replacing the diseased pulp with a safe, biocompatible substance, the tooth is sealed to minimize the risk of further infection. In most cases, we also strongly recommend the placement of a new, customized dental crown so that the treated tooth’s function and appearance is fully restored. At Pasadena Family Dentistry, we’re often asked: does root canal therapy hurt? Our team is glad to let patients know that this procedure is more comfortable than ever before with today’s modern comfort techniques and state-of-the-art technology. The discomfort that most patients incorrectly associate with root canal therapy is actually the pain they’re experiencing because of their infection; after their treatment is complete, they’ll be amazed by the relief they feel now that it’s gone!